Among the many Amish cabinet makers, quilters, and contractors, you occasionally come across specialist businesses which fulfill a niche need or focus on some throwback trade which relatively few in society handle. Taxidermists or shoe repair shops come to mind as examples. 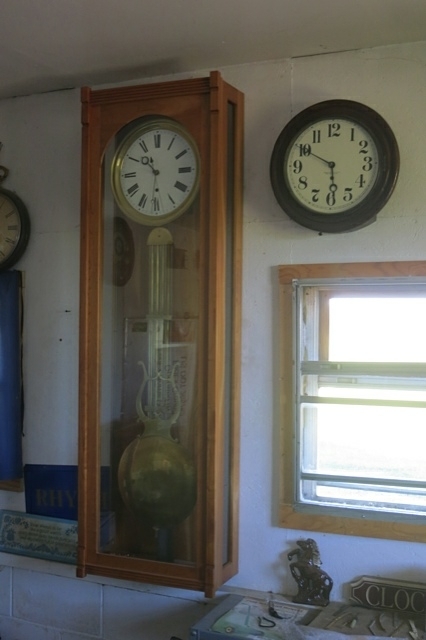 Today we have a look at an Amish clock and watch restoration shop, another rare trade which you sometimes see in Amish communities. 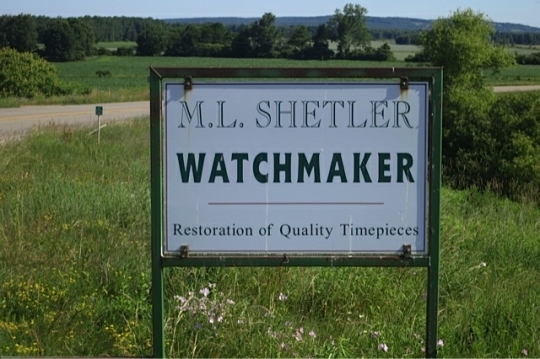 Tom took these photos of Mahlon Shetler‘s watch and clock repair business, found in South Dayton, New York (near the border of Cattaraugus and Chautauqua Counties, about an hour south of Buffalo). 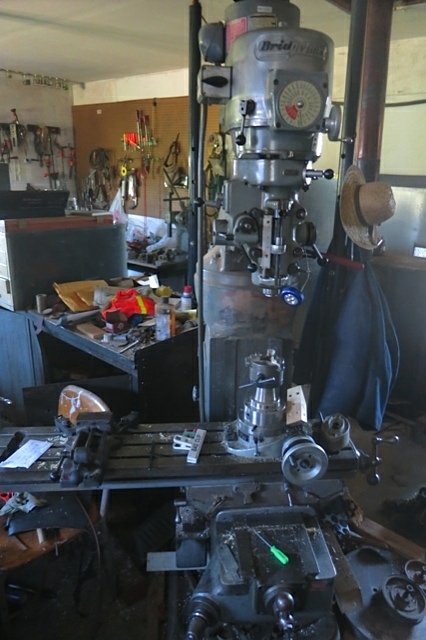 As you can see by the sign Mahlon simply goes by the “Watchmaker” handle. As for Mahlon, Tom says that their conversations are highly interesting: “you could talk to him for hours”. In lieu of that you can read his writings, as he is a scribe for Die Botschaft. I suppose all the mailing means the timepiece business is doing alright. 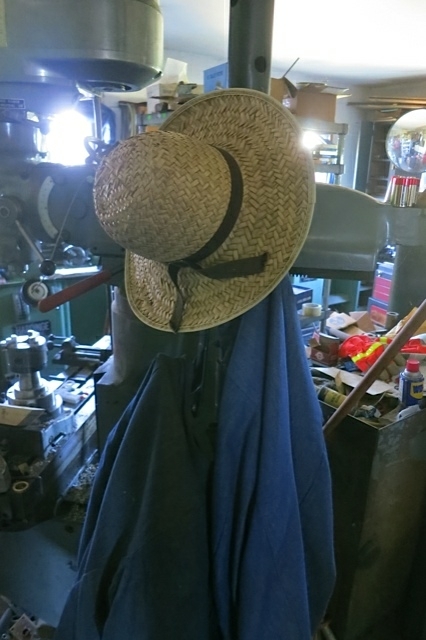 Hats. Less essential for watchmakers than farmers? I have to imagine that if he weren’t an Amish clock specialist Mahlon would be some kind of engineer. Among the Amish, talent that might otherwise be university-tracked in one direction can still thrive in a different, and even rarer, field. Imagining the attention to detail, steady hand and sharp eye that must be required in this trade…makes my head spin. Looking more at these photos, I have to think this is actually part engineering, and part artistry. It’s a high-level skill, and I’d have to bet it’s a lot more passion than drudgery for Mahlon Shetler. “It is said that all Amish are not the same,” writes Tom, “and Mahlon is a good example.” Thanks Tom for sharing, and if you’re in upstate New York and need work done on your heirloom timepiece, you might give Mahlon’s place a try. Thanks Tom, you’ve been doing great helping me keep these pages filled with new posts! I’m partial to anything clocks, so I was thrilled to receive this from you. Thanks Tom for sharing your story and priceless pictures. Since I was a kid I found clockmakers/repair shops intriguing. 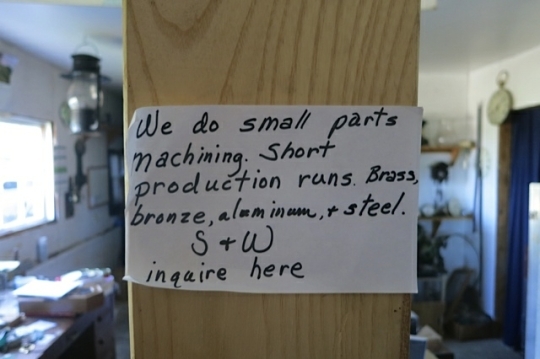 I currently buy my clocks from Isaac Kauffman’s Handcrafted Clocks in Ronks, PA. Last year I dropped off a clock to have him oil and check the springs. It gave me an opportunity to talk more with him than I have in the past. Isaac explained that his father was Old Order Amish, a farmer and a clockmaker. Beyond Mr. Kauffman’s story, I can’t help but compare a clockmaker to God being the potter and His children being the clay. If you have the opportunity to find yourself in his shop and it’s close to the hour mark, the shop becomes alive with chimes, bongs, cuckoos, etc. A symphony of sorts lasting approximately a minute, with the occasional stray chime from those not wound quite so tight. I enjoyed your beautiful comment. We have also been to the “Clockmaker’s “Shop. It was exactly as you described. We brought in an antique schoolroom clock that no one else seemed to be able to repair. Remarkably it is once again happily chiming each hour for us. This clock was one that I am sure both our fathers checked out often in the early 1900s and both my husband and myself would have glanced at it often as we attended the same school in the 1940s. Isn’t it wonderful that there are men like Mahlon schooled in the old and still needed masters of clockmakers. It is much harder to build relationships with Amish women than their husbands. I have done business with an Amish man for many years and have never met his wife. She is always in the house and he is in his shop. I have a large quilt collection and woman who have quilt shops are the exception…you can get to know these women. It would be nice to show Amish women in her daily life and I have enjoyed viewing this part of Amish life, taking photos would be too great an intrusion. On many occasions I have had the pleasure to eat dinner with Amish families…the father sits at the “head” of the table and I sit at the “foot” of the table…I feel honored. In the future I will try to share glimpses of Amish women. Thanks for this article. Twas very interesting. My Dad always did business with an Amish watchmaker between New Wilmington and Volant, PA. Not sure if this business still exists or not! It’s amazing to think of how “high tech” clocks were; you go down to the mill area in the museum, even the state-of-the-art carding mill extensively uses wood on moving parts where similar machines today would be made from all metal. I am enjoying reading about the Amish and the different trades they do for a living. Wish we lived closer. I have an old clock in need of repair. 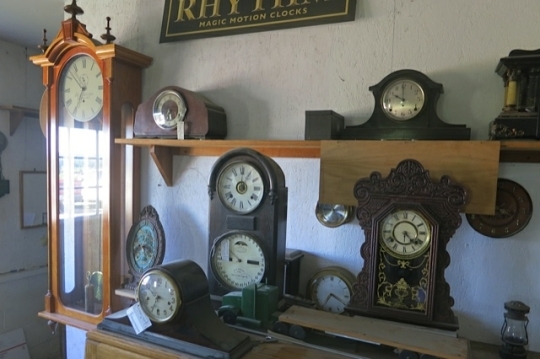 What wonderful clocks, and what a timeless profession (no pun intended). Despite the proliferation of battery operated clocks and watches, there’s something close to reverence when it’s time to wind up an old clock, or an heirloom watch. Does Mr. Shetler have an “apprentice” (son, I suppose, as I don’t know if a daughter would/could be expected to learn the trade)? Obviously, his skills are still in great demand! As with shoemaking, I still know of a watch/clock repairman in my own town. He’s had a shop here for about 10 years, and I honestly don’t know how he makes a go of it, but I hope he stays around a while longer! Along with the shoemaker in the town next to mine, I hope to be able to show my young granddaughter (someday—she’s not quite 16 mos. old now!) these shops and the men who run them (like I remember from my childhood). I hope they’re not just something she’ll read about in history books! I, too, look forward to “women’s work” photos/articles, as it pertains to various Amish groups (conservative & progressive). Thank you! Seeing all these clocks reminds me of my husband’s Uncle Dan. 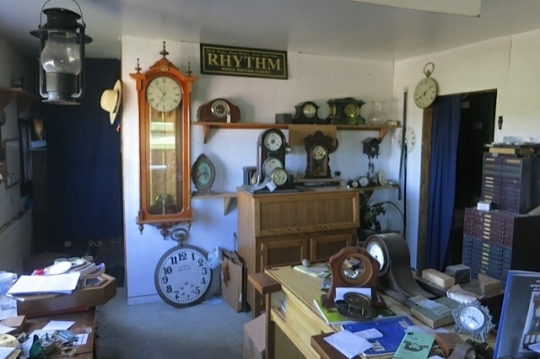 Uncle Dan had a collection of clocks he carted around to flea markets. Although he was a shy man of few words, he liked to be around people and his clocks gave him something to talk about. One day a stranger stopped at his table and offered to buy the whole collection. Uncle Dan wasn’t in it just to make money, so he named a price guaranteed to make the customer walk away. To Uncle Dan’s surprise and dismay, the customer agreed to pay the asking price. Uncle Dan had to let all his beloved clocks go. Although the loss of the clocks may have had nothing to do with it, Uncle Dan died within a year. I wish I lived near Mahlon’s shop. My mother left me a clock that I’m sure he could fix. I just live too far away to check it out. Maybe I’ve asked, or someone has asked, before, but do the Amish wear wrist watches? Clocks in their homes makes sense, you do know when to when to do your chores, but since wrist watches gained popularity during and after the First World War, I can’t help but wonder how worldly, un-plain and English the Amish consider the now common place watch. Every Amish man I know has a pocket watch. That’s right Shom, no wrist watches, but pocket watches abound. A wrist watch is considered an adornment or jewelry, which Amish don’t wear. Tom; thanks, I didn’t know that. Can you post the name and mailing address of this shop. More than once in The Budget’s “Information Please” column I have seen requests for place for clock or watch repair. Do you have the address for the clock shop in Ronks, Pa? Or at least the road name would help. I’d like to stop in on my next trip. I recently inherited my grandfather’s pocket watch, but it doesn’t work. I could really use the services of a watchmaker, especially since I want to pass this watch on to my son. Do any of the Amish watchmakers take in orders from afar (Oklahoma)? It is very interesting learning about the Amish on your blog. To the ladies who wish to know about Amish women, you can go to the websites of Amish fiction authors and they sometimes talk about the women they come into contact with. One author I have found, Sarah Price, blogs about her travels to Lancaster. She visits Amish friends and shows lots of photos and tells great stories. Most of her photos do not have faces, maybe from a distance. Anyway, most authors of Amish fiction I have found base their stories on real life Amish families. I am a very lucky man to have Mahlon Shetler as my friend. He is a true gentleman and honest as the day is long. He has repaired many pocket watches for me and they are all first class. I enjoy and value his friendship. Thanks for sharing the resource with us. I used to live in Chautauqua County a few years back and visited Mahlon often. 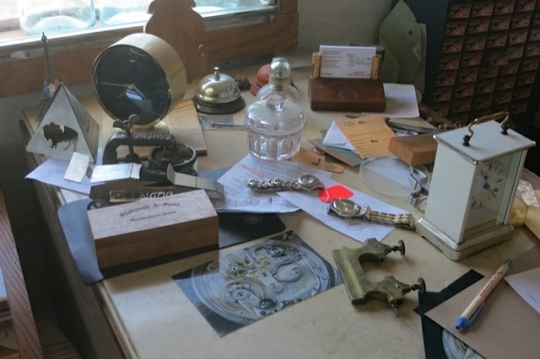 He made pocket watch parts for me and also repaired the more complicated issues for me. Mahlon and his workers called me the wind-indicator man because I took him a Waltham Vanguard size 16 with 23 jewels and the wind-indicator option for repair. He made a new pallet fork for me and serviced and timed the watch. As always he did outstanding work. I purchased a 3 weight wall clock from him that he made for someone that did not end up buying the clock. I still have it and it still chimes away every 15 minutes. It is an amazing clock. I miss going to see him. You won’t find a nicer man or a better watch and clock maker anywhere.